A couple of weeks ago, I was boasting that we had learned (from Samuel) what a good idea it is to scan the beginning and ends of clues for a few seconds before beginning to solve. 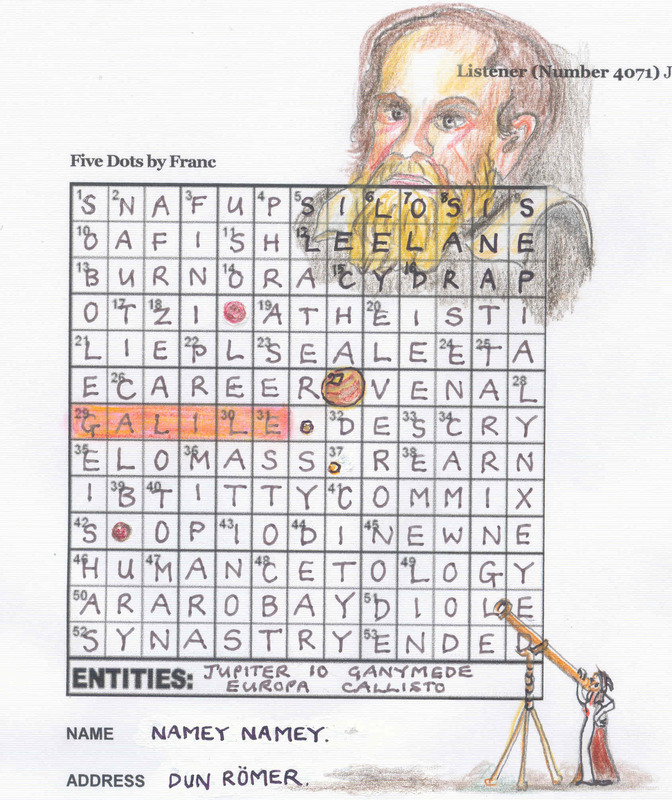 How I kicked myself when ACROSTIC finally appeared as a compilation of those misprints to give the instruction: EXTRA LETTER FROM CLUE N OCCURS N TIMES IN FINAL GRID – and even then, the Stripey Horse (5) Z?? ?A team didn’t immediately understand that we had to count the number of times that each of those letters occurred in the grid, in order to discover that we were looking for an anagram of ICORRAATTSS that meant NEBS, NYBS, NABS, NUBS, NIBS or NOBS. Indeed, for our developing skills, the grid fill was straight-forward, especially as we quickly found TAUNEUTRINO, ORIENTEERED, SOMERSAULTING, ANOPLURA and STREETSWEEPER but the extra letter produced by the wordplay is invariably a problem for us. Take this week’s stinkiest red herring. ‘Saddo, desperate and shown up (4)’ Well, we have the NER already, so it has to be NERD. Hmm, the wordplay. D – that must be the Desperate, so REN will have to be ‘shown up’ – and Eureka, it is! Chambers gives REN as an obsolete version of RUN and we all know that run (a film, for example) is shown. Needless to say, we missed the ‘I’ that should have appeared as the extra letter in D(I)RE with ‘N for ‘and’. We are quite proud of having acquired a number of Listener regulars, like NE for NOT. Thus ‘To get to know king? Not at all!’ gave us an extra E (At all? We wondered about those two words). Suffice it so say that our initial set of eight words didn’t produce ACROSTIC. We had ACCRETES and attempting to ‘accrete’ the stubs of down words took us nowhere. As usual, we were wisely advised to think again. When we, at last, understood that simply counting the appearance of those ACROSTIC letters in the grid, with the clever touch that the C appeared in both 1 across and 1 down, and thus only once in our final word, we were not so much niggled by the fiddly task as surprised at the ingenuity of the setting. I am certainly not alone in wondering how Ten-Four went about making sure the clue numbers corresponded with the number of times the letter appeared, with the addition of his hidden ARISTOCRATS and NOBS. Thank you Ten-Four. Do, please give us a setter’s blog! 1a “Erratic singular comet’s moving with some spin” ⇒ SOMERSAULTING. Anagram of SINGULAR COMET’S with extra C.
12a “To get to know king? Not at all” ⇒ LEARN. “King” ⇒ LEAR and “Not at all” ⇒ NO, with extra O. 16a “Acted in a leading role—looked hard” ⇒ STARED. “Acted in a leading role” ⇒ STARRED, with extra R.
19a “Eavesdrops on sort of Mediterranean bar?” ⇒ TAPS. “Sort of Mediterranean bar” ⇒ TAPAS, with extra A. 1d “Undisciplined cop’s so lost organ parts!” ⇒ SOLO STOPS. Anagram of COP’S SO LOST with extra C.
14d “Influence young bird (not European)” ⇒ PULL. “Young bird” ⇒ PULLET, with “European” ⇒ E removed, and extra T.
18d “Eating rock dries up small arthropod” ⇒ SEA SLATER. “Rock” ⇒ SLATE inside “dries up” ⇒ SEARS, with extra S.
20a “Twelve, possibly concerned with organs” ⇒ RENAL. 8d “Resulting from the actions of five at a funeral, I give out and take money” ⇒ TELLER. 9d “Saddo, desperate and shown up” ⇒ NERD. At this point I spent an embarrassingly long time trying to work out the hint. I noticed that none of the extra letters was in an answer that goes below the isolated word: they are all in clues that start in the top half of the puzzle. So I started looking for hidden words that extended downwards from the isolated word. A point in favour of this idea was that that the word extending down from the tenth letter of the isolated word would have intersected with 29 across and resolved the five-way ambiguity there. The trouble with this idea was that there were far too many possibilities for the words, for example the word descending from the first letter of the isolated word could be CUE, DUE, GUE, HUE, RUE, or SUE. Then I looked up ACROSTIC in Chambers . It’s “A poem or puzzle in which the first (or last) letters of each line spell a word or sentence”. Of each line. An across-tic. And indeed the initial letters of the clues spelled out EXTRA LETTER FROM CLUE N OCCURS N TIMES IN FINAL GRID. Anyway, after counting up letters, I found that I was left with the twelve letters AACIOORRSSTT to finish the grid. 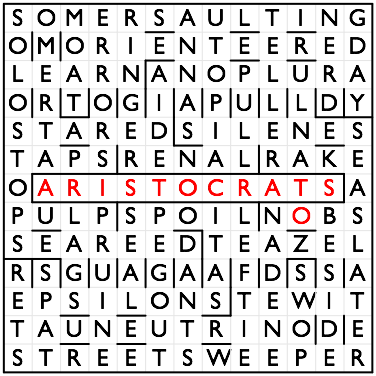 These spelled ARISTOCRATS, leaving an O for NOBS. Listener 4071 – Oi, Galileo! Franc, with this his fifteenth Listener since 1994, is one of our more prolific setters but it is somewhat surprising to see from Dave’s Database that he has yet to set for any other principal series. His first was slightly marred by printing mistakes (missing bar, incorrect grid length) but my overall impression is of straightforward fun puzzles. His previous Listener was entitled Three Rings so are we perhaps seeing a series evolve here? Five Dots – Seven Dashes – Nine … The most memorable for me was *** (Letters from America) and I see that former LWO blogger, Duncan Horne, won the prize for that one. Having a box beneath the grid to complete a Listener seems to have become rather commonplace of late. This is the third this year and we are not yet out of January. 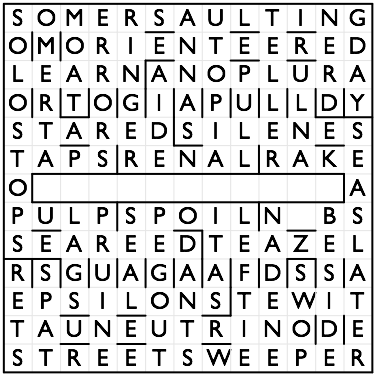 I counted a total of nine in 2009 while 1999 had none as such although several puzzles required entries to be made beneath the grid. Of the Listeners that I have attempted, Jeffec’s Stocktaking was the earliest example found (No.1988, 1968) – AUTOLYCUS was to be entered in the box. I cannot see that their appearance indicates any dramatic change in puzzles rather than just to tidy them up and perhaps they are not always needed. I agree with Andy Stewart that Dog and Bone the other week was superfluous since you were repeating yourself if you thought that you were drawing the outline of a bone above and in the end it didn’t matter if you thought it was a phone (as it surely should have been). I considered this another box that may have been better left out since how could anyone possibly have solved the puzzle without knowing what the dots represented? Also, there was not a great deal of room to list everything. Solvers should attempt to get things in proportion although precision is not required. I suppose that it has been noted by others but I thought it very clever of Franc to have revealed that apt connection between Io and Galileo’s full name. It was pleasing to see from Chambers that the distances of the moons from Jupiter in the grid were in the correct order – I wonder how often this ties in with the apparent distances when viewed from Earth? 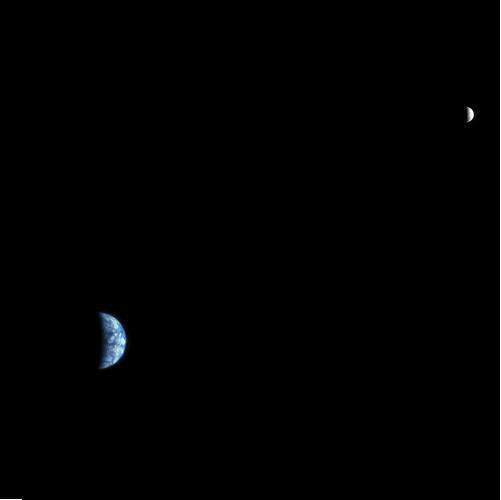 The ratio of the diameters is just 3.7 to 1 and I have heard it suggested that we might be considered a double planet even though the Moon is the satellite. The Crossword Database gave just the one return when searching for Jupiter so this may be a first as regards theme. However, resolving clashes in cells in this way was strongly in vogue ten years ago when we saw London Underground stations, place names on the San Andreas Fault (Franc Spots the Join no less) and US Presidents appear, among others – hugely exciting at first, it soon became a hackneyed device but worth resurrecting now and again, especially to entertain newcomers. There was no sign of this in the ODQ (2nd or 5th ed) or Chambers DQ (1996) so possibly an invention but it was readily found on the Net, attributed to Galileo. So, to sum up, an entertaining and thought-provoking puzzle – thank you Franc. After several straightforward weeks, I have the feeling that we are due a difficult puzzle, and this looks like it’s going to be the one. There are extra words in all the clues, “the first and last letters of which contribute to a common version of a thematic statement attributed to a name.” The name, or rather “six contiguous cells” of it, is to be found and highlighted. 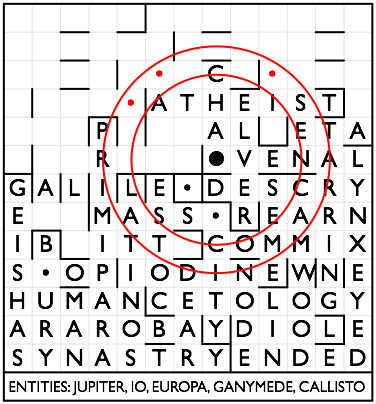 There are four clashes in the grid, with dots to be entered at the clashes, and a fifth dot to be discovered. The grid has numbers but no bars. Why no bars? If I understand the rubric correctly—“Numbers in brackets give the numbers of cells used for the grid entries”—I should be able to just fill in the bars right away based on these numbers. Surely the setter wouldn’t just omit the bars to create a mechanical task for the solver? There must be some thematic reason that I don’t yet understand, some need to disguise the lengths of entries, perhaps. So to be careful, I’ll only enter the bars that I believe are absolutely necessary: that is, the ones to the left of across entries and the ones above down entries. The clues, now that I come to them, are really hard. I guess it’s my inexperience, but I find clues with extra words very difficult. 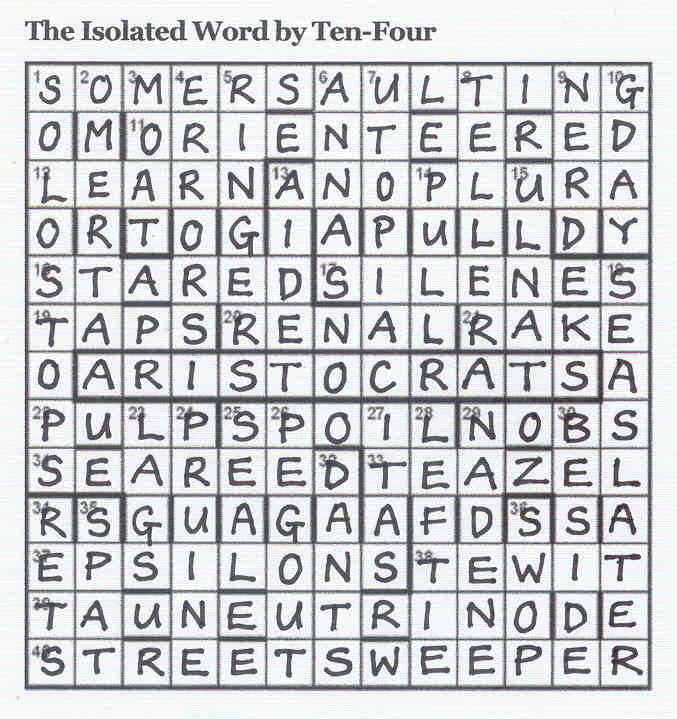 My clue-solving technique depends on parsing all the words to form theories for the structure of the wordplay, but the extra words thwart this. After an hour of staring at the paper, I have only half an answer. 47 down, “Husband sources of manganese, uridines and nitrates (3)” is MAN (if the extra word is “uridines”) or MUN (if it’s “and”). By Wednesday evening, I’ve spent about three hours on the puzzle so far and I have only thirteen entries, with no clashes yet discovered. However, the letters from the removed words are suggestive. If I take them in order by clue, first—last—first—last— etc, then I get nonsense, for example, …LEILELVEECTTHH at the end of the across clues. So maybe I need to take all the first letters and then all of the last letters? Back at the crossword, the quotation identifies all the extra words, making the pace of solving merely very slow, rather than glacial. After another hour or so, I’ve filled getting on for half the grid, but I still haven’t found any clashes. 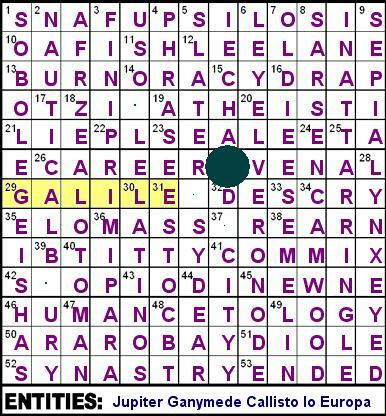 However, I can see Galileo’s name starting to appear in the unchecked letters at centre left. Let me think a bit more about the rubric. 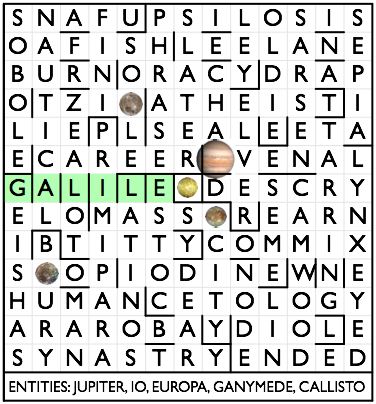 I need to find five dots associated with Galileo. The obvious possibility is that the five dots represent JUPITER and the four Galilean moons, IO, EUROPA, GANYMEDE and CALLISTO, which Galileo first saw through his telescope 400 years ago, some time between December 1609 and January 1610. Each of these moons has a name that’s even in length, so could be indicated by a clash with half the name in each part, for example I clashing with O, or CALL with ISTO. Now that I have this idea, it’s easy to spot SCALLOP clashing with BISTOURY in the lower left to give CALLISTO, and MASSEUR clashing with OPACITY in the middle to give EUROPA. And the disconnected cell in the very centre of the grid must be JUPITER. I’ll draw it a bit bigger. After solving a couple more clues I consider 27 across, “Corrupt Idaho satirist”, the answer to which has to fit into _V_ _AL. It looks like it ought to be •VENAL with the dot representing JU. And yes, the clashing answer at 15 down (“Capital ombu tea”) is CHAPITER. So this clash is JUPITER, and so the dot in the middle must instead be IO, which can be understood to represent a clash between GALILEO and GALILEI. How delightful! 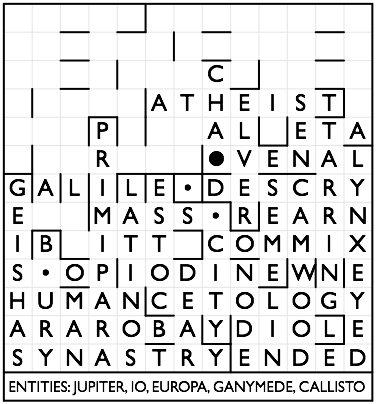 This seems to be about as good a fit as you could expect from a crossword grid. So GANYMEDE, with a semi-major axis of 1,070,400 km, must lie between 3 and 4 grid cells from Jupiter. If I draw two circles with radii of 3 and 4, Ganymede most likely lies between the circles, in one of the three positions indicated by the red dots. Are any of those positions right? Yes, 11 down, “Good fish? Rather old”, is SOMEDELE, and 17 across, “Gypsy exfoliants blasted zit”, is TZIGANY. I can see now why the grid is not symmetric: getting the Jovian system to scale must have been a tricky constraint. The remainder of the crossword is still no pushover. There is one clue I don’t understand. 23 across, “Ratify losing part of Ogilvie clan” is SEAL. “Ratify” is the definition, but how does the wordplay work? The ‘Stripey horse (5)’ team has come a long way since our very first attempt at a Listener Crossword. That was in November, 2008 and it was Franc’s ‘Three Rings’. What a pleasure to download another Franc, with the rings reduced in size but increased in number. I remember that ‘Three Rings’ took us a week to complete, though we had guessed the theme fairly early on. This time we had an almost complete grid in a few hours, and that long quotation quickly gave us the theme. No, we are not suddenly learning to cope. Franc certainly gave us an easy solve this time with those fairly obvious extra words: OATES, LNER, OGILVIE, IDAHO, GWEN, OMANI, ABBA, THAI, WATCHET, DOLLGELLAU and URIDINES. We didn’t even need the Internet to complete, “I do not feel obliged to believe that the same God who has endowed us with sense, reason and intellect has intended us to forgo their use”, but we were delighted at Franc’s ingenuity in fitting it all so neatly in. Galileo was the culprit – but how? When we have solving problems, we invariably suspect our understanding of the wordplay. Yet, somehow, this time our problems focused on four areas of the grid. TZIGANY was the likely answer for ‘Gypsy blasted zit’ but where did the GANY go? JUVENAL had to be the satirist, but the wordplay justified only the VENAL. There was some cumfudgery going on here. The other half of the team, by this time, had his nose in a book but he did mutter, “Well, Galileo discovered the largest four of Jupiter’s moons”. Of course! All that remained was to work out the wordplay in those intersecting spots on the grid. : (JU)VENAL/CHA(PITER), MASS(EUR)/(OPA)CITY, TZI(GANY/SO(MEDE)LE and S(CALL)OP/B(ISTO)URY. The other moon was IO, of course – so I had my five dots. 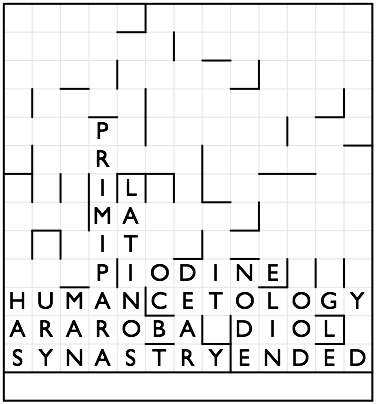 With immense delight, I inserted the dots and the names in the space below the grid – and slept on it. Morning dawned and a nagging doubt about IO – then amazement when I realized that we got the I from GALILEI and the O from GALILEO – and that the moons were in the right positions in terms of distance from their planet. Oh yes, we had our problems. I had DROP for 16ac but no idea how it fitted the wordplay, ‘Nobleman’s charge for drink’. I wonder whether I was alone in that error. Of course I needed DRAP – D(uke) + RAP for ‘charge’. 23ac had me flummoxed too. ‘Ratify losing part of clan’ (SEPTAL losing the PT to give SEAL). The most difficult of all was 43ac. ‘I (love) indigenous broadcast – not badly sung’. Is that what we call a subtractive anagram? Now that I understand the wordplay, I love it too! (Indigenous as an anagram of IODINE and SUNG with that simple I for iodine, as the definition). Great fun, this one, but with no wrens to construct, art works to forge or cherry trees to chop, my fingers were itching, so my five dots turned into excessively large moons and I brought Galileo in to supervise it all.